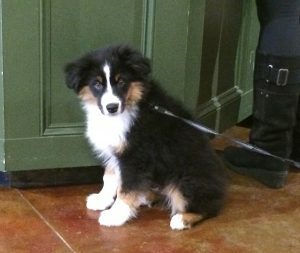 Green Dog Pet Supply - Should I Shave My Fluffy Dog in the Summer? Should I Shave My Fluffy Dog in the Summer? 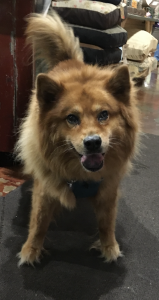 Posted July 27, 2018 by greendog & filed under dog safety, grooming, Pet Safety, Products We Love, Useful. I just saw a little rant online from some well-intentioned woman begging dog owners to shave their poor dogs in the summer, as she felt so bad for them. I thought it might be helpful to address that question here. Actually, shaving some breeds of dogs can actually make them quite a bit hotter. Shaving some breeds can destroy their coat which may never grow back in correctly. More importantly, double-coated breeds are designed to shed their undercoat and leave the guard hairs (top coat) intact, which then acts to shield the dog from solar rays, reflecting them away. When you shave the dog, it removes the protective layer exposing them to greater risk of sunburn, skin cancer, and especially heat stroke. The reason? Removing the top coat causes the fluffy base layer (the hot one that they usually shed in the summer) to grow back quickly, covering them with a thick hot layer of insulating fur. You’d be cursing them to wear their winter sweater in the heat instead of their sun shield! The other bummer about exposing the woolly undercoat is that it becomes a magnet for foxtails, burrs and dirt – the slipperier outer coat is more resistant to these things. For thick, double coated breeds, a good groomer can help to further remove some undercoat without damaging the top coat. 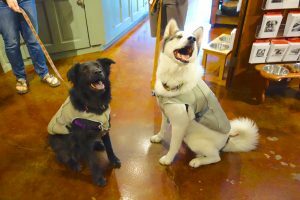 There are also amazing tools like the Swamp Cooler by Ruff Wear, which we carry at Green Dog Pet Supply. It’s one of the best safety tools for dogs we’ve ever encountered and goes such a long way in keeping dogs from overheating! A greater safety concern for dogs in the summer (that people often are oblivious to) is protecting dogs’ pads from burning on hot pavement! 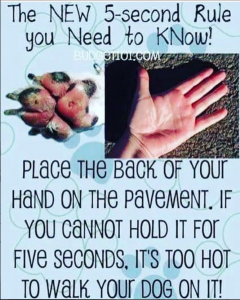 Putting the back of your hand on the pavement for 5 seconds will tell you if it’s safe for your dog to walk on it. Yesterday’s high 90s temps resulted in pavement temperatures outside our store of 145 degrees! This is easily hot enough to cause permanent damage to the tissue on their feet. Keeping your activities to early in the morning or after the sun has dipped below the horizon is advised, as well as using fun things around the house like kiddie pools and sprinklers for playtime, giving frozen treats that they have to lick to rapidly cool the body, and wearing protective gear like dog boots and Swamp Coolers when you do have to go out are all good ideas! What’s your favorite strategy for keeping your dogs cool?